So after a short period of very little activity, there is now a serious push to get Kumeu back into being an active observing site. 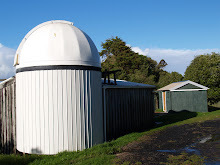 With a new group of members from Auckland Astronomical Society looking to do some more research oriented projects, and a steadily growing enthusiastic group of astrophotographers, the time is certainly right to dust off the dome and get some activity going. The other thing that has happened that is very exciting for the observatory is that the old (yet reliable) "push to" fork mount for the C14 "Nustrini" OTA has now had a fairly serious upgrade to a Software Bisque Paramount GT-1100S - that belongs to Stardome and became available due to the upgrade of the research dome equipment there earlier in the year. Having a fully robotic mount means that the startup process is dramatically shortened, and also observing sessions should be much easier (and able to be fully controlled from outside the dome itself). I will be posting updates regularly here as work progresses, and once we are back into the swing of observing regularly, there should be regular logs of the sessions and observations.